Eliminate wasted time dealing with multiple vendors with our less cumbersome processes. Enjoy more favorable payment terms with a wide range of alternative financing options. Know precisely what your software costs are with transparent and efficient spending practices. Stop juggling multiple vendors with a more reliable and efficient TCGi program. With a custom-tailored Managed Procurement Service program from TCGi, you’ll reduce complexity while streamlining operations, processes and substantially cutting the amount of time your procurement staff spends managing vendors, enabling them to focus on higher value activities. Our programs solve it forward for you with lower total acquisition costs while converting your purchases to a Tier-1 diverse spend. 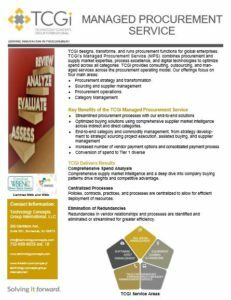 TCGi gains a working knowledge of your current procurement process by conducting a full evaluation to obtain an accurate picture of where your opportunities for improvement exist. TCGi develops and implements a strategy that simplifies your procurement process by deploying your organization’s resources more efficiently. TCGi helps you eliminate unneeded transactions and simplify your procurement process by identifying areas of redundancy and inefficient spending. TCGi gives your organization greater spending flexibility by providing more favorable terms. Your IT organization will also enjoy more latitude when paying invoices.